The ultimate holiday destination be it summer or winter. The Beach Bach is one of two absolute beach front properties. The other property - The Beach House - is listing number 20044338 on homeaway.co.nz Both properties are independent dwellings with their own, separate entrances and parking areas. Beach on the doorstep and shared use of kayaks. Or for a cosy winter get-away enjoy the log fire and outdoor spa pool. 4 bedrooms, with king and queen rooms in separate wing; 2.5 bathrooms. Sleeps 9 (maximum 6 adults). Large sun drenched deck overlooking the beach and the boats in the Bay. Bed linen, bath and beach towels and kitchen tea-towels provided. Adjacent to the coastal walkway from Opua to Paihia. Short walk along the coastal walkway to the ferry to Russell. Sleeps 9 but maximum 6 adults and the rest children. Guests use the property, beach facilities and water equipment provided at their own risk and are expected to do so responsibly. No illicit drugs to be bought onto the property or used by any guest or other person at any time. No inappropriate use of wifi provided. Smoking permitted outdoors only and away from entrance doors so smoke does not drift back inside. 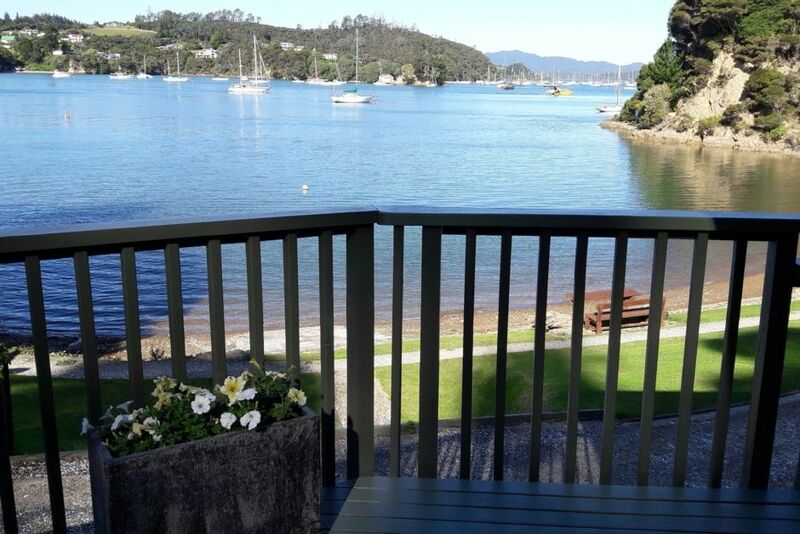 We are a husband and wife team who love our life in the Bay of Islands and enjoy hosting our guests during their annual holiday or weekend breaks. Since moving to the Bay of Islands we have done extensive renovations to both our holiday rental properties and look forward to having you stay some day. Absolute beach front; modern and well equipped; outdoor spa pool with views of the Bay for exclusive use of guests. The Beach Bach enjoys stunning views over the Bay and beyond. The Beach Bach is situated on an almost private beach with a swim pontoon and kayaks to enjoy. Suzanne was a great host. The bach was well presented with lots of extra's that you don't always get in a holiday home including home baking! An absolutely beautiful spot - can't wait to go back, the kids agree!! Best spot ever,fishing on the beach,enjoying the spa,watching a movie and the view can't be explained you have to see it for yourself,this place is the definition of paradise and close all amenities. As noted above, totally relaxing, peaceful, memorable, modern, high recommended. Lovely location and property, with everything you need. The property is so comfortable and tidy, and the view from the deck is wonderful.